Our friend, F., taught Alexis how to make wontons several months ago. She thought it would be a great, easy meal to make at the cabin in Tahoe, so we brought all of the requisite ingredients with us and spent an afternoon folding wontons. They were very good, although not as good as F.'s. We think that the wontons skins are to blame, as they were too thick and from Whole Foods, which is decidedly not the place for authentic Asian ingredients. The Wontons post-folding are above. Fresh minced ginger, fresh sliced scallions, chili garlic sauce, sesame oil, dark soy sauce and rice vinegar. The wontons after boiling, in the sauce. Mix all of the ingredients except the wonton skins thoroughly until combined. Use chopsticks to add a very small amount of the meat mixture on the center of a wonton skin. Wet the edges of the wonton skin and it into a triangle. Then take the opposite ends of the triangle and fold them towards each other to create the wonton. Boil in batches for 6 minutes at a time. Serve immediately. In preparation for a day of skiing/snowboarding for Giao and E. we made a hearty breakfast of French toast with fresh blackberries and crispy bacon. In n' Out has to be the best deal in terms of cost per calorie and we love that they have the low carb "proteins style" option. And it's quick to boot. Mmm. Meat, cheese, fried onions, special sauce, all wrapped in crunchy lettuce. We rarely ever order fries because 1) we try to stay away from carbs and 2) we don't usually like In n' Out fries because they are not crispy enough. However, we heard you could order fries "well done" and so we did. They were markedly better; much more crispy. This chicken salad is very easy and can be made with any veggies you happen to have on hand. We had cherry tomatoes and onions, so we mixed that with a shredded rotisserie chicken and equal parts mayo and dijon mustard. Giao had to rush to work 'early' this morning, and his morning route takes him past Enzo's Italian Deli every morning. It's a little mostly outdoor place, with a friendly owner. He had always wondered how the pizza was there. He wasn't disappointed, but only because he has very low expectation for San Francisco pizza. Though it was a generous size, and the sauce was tasty, the crust was too thick and cake-y. 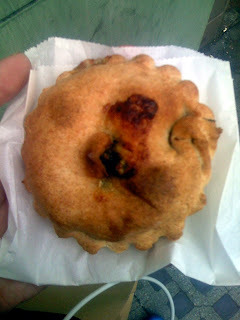 It was a dreary day today, so when Giao passed Kearny Street Hand-Held Pies today on the way back from his eye appointment, a warm pastry enclosed lunch sounded like it would hit the spot. The restaurant is very small, more like a bakery, with the pies under glass, than a true lunch spot. Giao was pretty disappointed in the selection of protein, there was only one with beef, and one with chicken, and neither of them sounded appetizing. It seems caters more to the vegetarians and vegans. The service was a little curt, but that mostly consists of putting a pie into a bag, so no big deal. The pie itself was nice and warm, with a good mix of ingredients. It is much too small for meal, it's more like a snack. The last time we came to Pen Thai we proclaimed it to be the best Thai we'd ever eaten. We went back with high hopes and were pleasantly surprised that it was still very delicious. Why can't everyone make Thai like this? We had really high hopes for this duck. It looked delicious. It smelled delicious. It arrived at the table sizzling audibly. However, in the end, the meat was a tad dry. This, it was a pretty tasty, coconut-y dish. There wasn't a ton of crab in this rice, but it was delicious nonetheless. It was light and not greasy at all, and very flavorful. This may be the most tasty dish ever. It's super-crispy, super-garlickly, ever-so-slightly sweet and totally addictive. This whole, fried fish was slathered in garlicky goodness that we later used the fried rice to sop up. Every year Alexis' family chooses a different theme for Christmas dinner...and they spend all day cooking and drinking. The food always turns out delicious and this year was no different. The picture above is before we dug into it with our fingers and the picture below is after. b'stilla is a classic Moroccan dish made of shredded chicken and egg layered in phyllo dough and sprinkled with powdered sugar. Alexis' mom made this version, but basically, you boil a chicken in a bunch of spices, including saffron. Then you pull the meat off and set aside. You reserve the cooking juices as stock and cook the beaten eggs in the broth and strain that. Then you mix together the chicken and egg mixture with more spices and layer it between sheets of phyllo that have been brushed with melted butter. You bake it on 350 for about 1/2 an hour, until golden brown, then you turn it over on a plate and sprinkle liberally with powdered sugar. Delicious. Usually harira is made with lamb, but we'd been eating a lot of lamb, so we decided to make this version vegetarian and were pleasantly surprised that it was quite good. Harira is a stew made with lentils, chickpeas, and tomatos in a lemony, slightly spicy broth. We also thickened this with a bit of rice. It was perfect when sopped up with some of Alexis' dad's homemade bread. This dish epitomized Moroccan food, especially in looks. It was pretty tasty as well. Although next time I'd just use dark meat rather than the whole chicken, as the white meat was a little dry. Brown the chicken pieces in some olive oil and set aside in a large baking dish. In the same pan add the onions and garlic and cook until soft. Add all of the other ingredients, except the browned chicken and cilantro, and cook for a few more minutes. Then pour the sauce over the chicken in the baking dish. Bake on 350 for about 1 and 1/2 hours, or until chicken is very tender. Remove the chicken pieces from the dish and set aside in a covered serving dish. Pour the sauce into a pan and reduce by half, stirring frequently. Pour the sauce over the chicken in the serving dish, then sprinkle with the fresh cilantro. This was one of the stars of the night, made by Alexis' sister. This is also incredibly easy. You make the chermoula below, then toss the raw prawns in it to coat and sautee until just done, about 2 or 3 minutes. You could also use this chermoula on just about any protein. Put all the ingredients into the food processor and grind into a course paste. This beautiful salad consisted of equal parts fresh orange segments and thinly sliced radish, seasoned with salt and pepper. This salad was made of 3boiled beets, peeled and cut into cubes, a couple of handfuls of fresh pomegranate seeds, 1/2 a thinly sliced red onion and a handful of chopped fresh cilantro. It was dressed in a vinaigrette made from lavender vinegar, olive oil and sweet-hot mustard. This is a classic Moroccan side dish. Mix all the ingredients together and set aside to meld at room temperature. Eat on thick pieces of crusty bread. These carrots were grown by Alexis' parents and were sweet and fresh tasting. The carrots were steamed until tender, then dressed in lemon juice, fresh chopped mint, salt and pepper. In Alexis' family, the Christmas Eve tradition is to eat a gluttonous meal of appetizers. They used to buy them, but now that all of the girl's cook and it's not all left up to Alexis' mom, we spend all day creating the spread in the kitchen. It's much more satisfying than buying everything. We had some leftover mashed potatoes, so we added some cheese, made some flattened balls, dredged in flour and fried until crispy. These were delicious, quick and courtesy of Alexis' little sister. Sautee the leeks in butter until tender. Sautee the minced mushroom stems in butter until reduced. Add leeks and mushrooms to the goat cheese and season with salt and pepper. Broil the mushroom caps for about 5 minutes. Fill with the goat cheese mixture and broil for another minute on high, until tops are brown and bubbly. Alexis saw chickpea flour at the Indian grocery store and immediately thought "blinis" even though she'd never made them before. They turned out better than anyone expected, but they didn't reheat well the next day. Stir together water, yeast, and sugar and let stand until it foams. Add the chickpea flour, salt, then stir in milk, butter, and eggs. Cover bowl with plastic wrap set aside to rise in a warm place for about 1 1/2 to 2 hours. Stir , then ladle with a soup spoon into a hot greased pan. Cook like a pancake. We served these with greek yogurt spiked with a spicy, lemony, Indian spice mixture. Alexis' mom made these and they were very tasty. Very good in a bit of pita. Mmm. Pastry stuffed with cheese. These were also made my Alexis' little sister. Dressed simply in a bit of fresh squeezed orange juice. This tasty concoction was spiked with lime juice and surprisingly light in color. Great on the grilled naan. Alexis' mom makes awesome dolmas. This variation contained minced lamb (leftover from a couple of nights ago) and dried pomegranate seeds rather than currants. The requisite meats and cheeses. A simple, tasty side dish. Sautee the garlic slices in olive oil until just brown and crispy and set aside. Sautee the brocollini in the same pan until tender, stirring frequently. Sprinkle the garlic chips over the top of the brocollini and serve. Alexis little sister made these, but we think she just added a bunch of caramelized onion to the mashed potatoes. This was perhaps one of the weirdest methods of cooking that we've ever tried. Alexis' sister got it from a Moroccan cookbook. Who knew that you could steam meat for a tender, falling apart roast. Rub the lamb with all of the spices and the garlic and place the parsley on the lamb. Wrap the lamb in cheese cloth and place in a colander inside of a pot with about an inch of water in it. Bring the water to a boil and cover the whole contraption with a tight fitting lid or foil to create a tight seal. Steam the lamb for about 2.5 hours. Remove the lamb and quickly sear on all sides for a nicer appearance. Then serve. This was basically just the boiled down water and lamb juices and fat, but it was delicious. Yum. This is a tender, flavorful bread that Alexis remembers from her childhood. It is sweet but not cloying and totally delicious when spread with marscapone. We were looking for a protein-filled snack to tide us over until dinner when Alexis' mom pulled some Trader Joe's chicken skewers out of the freezer. They didn't look that tasty though, so we doctored them up with a quick homemade peanut sauce, which made the rather dry meat a much more palatable.